After attempting, for the first time, the VCAP5-DCD exam on February 04, 2015, I was quite disappointed with the result. I felt confident about many of the topics discussed, but I knew I was definitely weak on a few of the non-VMware related questions (focused on application design and Cisco’s networking products in a VMware environment). I knew I still wanted to complete the exam (purely to prove to myself), but life got busy throughout 2015 with work, marriage, and travel. My goal for 2016 was to sit down and practice for a retake of the VCAP–thinking that going for the DCA this time would be a better option as I am very confident with the hand-on components. Previously you took the VMware Certified Advanced Professional 5 – Data Center Design (VCAP5-DCD) exam. Based on additional data, we recently published a new form of the exam. This new form and the questions you answered correctly, resulted in you receiving a passing score. Your transcripts will be changed to reflect your passing status and certification status. You will now have access to all the benefits of being VCAP certified. 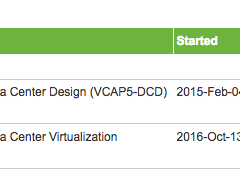 Time to push hard on that VCAP-DCA to complete the VMware Certified Implementation Expert (VCIX)!